The ENFORCER 4.5" Round Push Plate is designed for easy, accessible entry and exit through public area doors. The 4.5" Round Push Plate features a large stainless steel button with the International Symbol of Access and "PUSH TO OPEN" engraved for clear and easy visual and tactile identification. 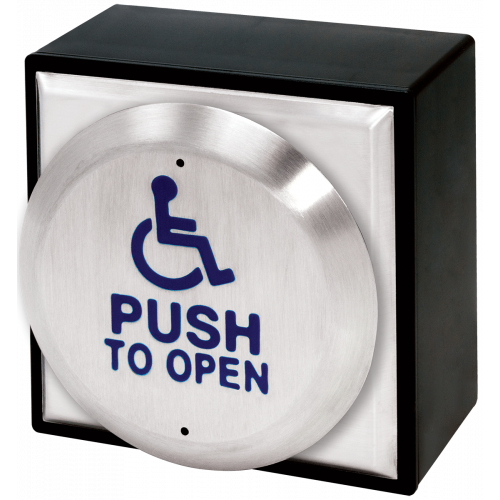 Featuring an operating life of over 100,000 cycles and a surface-mount back box for flexible mounting options, the ENFORCER 4.5" Round Push Plate is the perfect solution for reliable, secure, and accessible entry and exit for schools, hospitals, nursing homes, apartments, and other high-density public spaces.